Front line employees, managers and supervisors in manufacturing environments. Can we defeat Murphy’s Laws? Can we eliminate these costly mistakes? Probably not totally, but the use of mistaking-proofing tools and techniques will put an end to many of the repetitive, costly mistakes that rob us of time and money both at home and at work. Mistake-Proofing is more than just incremental improvements or trying harder to do a better job. Mistake-Proofing techniques don’t just reduce the chance of making errors, but they eliminate the possibility for error altogether. Mistake-Proofing online training will help put you on the path to defeating Murphy’s Laws. 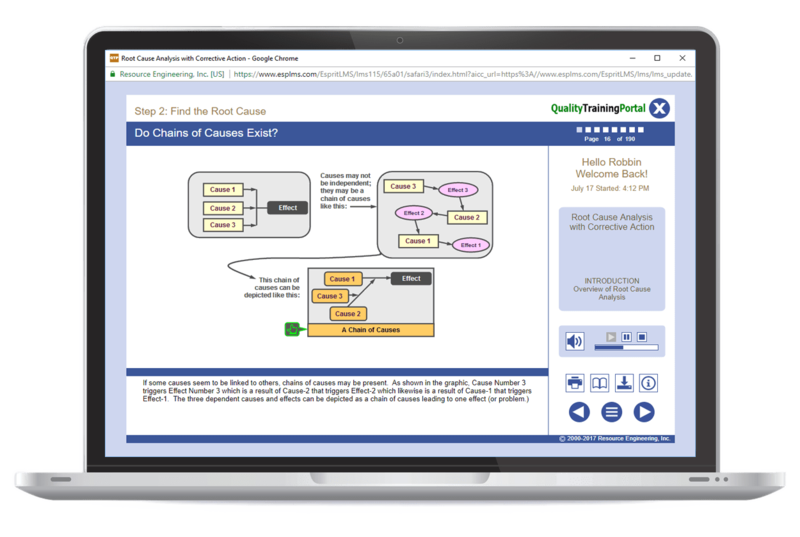 With Mistake-Proofing, you will not only learn a systematic way to error-proof processes and products, but you will also see a wealth of examples of mistake-proofing solutions applied to real-life recurring problems. Most people learn mistake-proofing skills by seeing examples and then stealing shamelessly to apply similar solutions to their own problems. That’s why Mistake-Proofing is loaded with lots of examples that will trigger implementation of more mistake-proofing solutions in your company. Check out Error-Proofing Business Processes if you are looking for Mistake-Proofing training in a non-manufacturing setting. Mistake-Proofing is divided into four units. Unit 1, The Mistake-Proofing Primer provides a conceptual background and foundation for mistake-proofing efforts. Unit 2, Effects of Mistake-Proofing, covers practical mistake-proofing techniques. Tools to design and implement mistake-proofing solutions are covered in Unit 3, Mistake-Proofing Solutions. Examples of problems along with accompanying mistake-proofing solutions in a variety of settings are explored in Unit 4, Mistake-Proofing in Action. Understand why 99.9% is not good enough and why mistakes must be eliminated for good. Identify different types of mistake-proofing solutions. Know how to use different mistake-proofing techniques and be able to identify the best way to mistake-proof a given situation. Integrate mistake-proofing as an integral part of an overall Quality Improvement Process. Error-Proofing Business Processes – Comprehensive online training in poka yoke/mistake-proofing techniques in non-manufacturing operations. The Five Why’s – Focused training in how to use the Five Why’s technique to get to the root cause of problems. Lesson 1 | What is Mistake-Proofing? Exploring the source of mistakes. The mindset necessary for mistake-proofing. Common examples of mistake-proofing all around us. Using these examples to trigger ideas at work. How process inputs create process outputs. Why the root causes of errors must be identified. Why prevention is always more powerful than detection. The role of teams in mistake-proofing efforts. Exploring the 8 forms of mistake-proofing solutions. Guidelines for selecting a mistake-proofing approach. Delving into the four families of devices and methods used to achieve a forced control effect. Examining 10 common families of sensors used to achieve a shutdown effect. Investigating 4 families of audible alarms and 4 families of visual alarms used to achieve a warning effect. A look at the use of color-coding, missing-in-action clues, and other aids to achieve a sensory alert effect. How to incorporate mistake-proofing solutions into common problem-solving processes. Assessment techniques for determining the practicality, feasibility, and cost-effectiveness of your mistake-proofing solutions. Tips for keeping your mistake-proofing solution from being ignored or disabled. Lesson 4 | How Robust is Your Solution? Assessment techniques for determining how robust your mistake-proofing solutions are. How to use ten continuous improvement tools to complement mistake-proofing efforts. Nowhere are the benefits of mistake-proofing more evident than in high volume operations. 8 real-life examples of mistake-proofing solutions in a high volume environment. Mistake-proofing is a perfect tool to prevent assembly errors. 8 real-life examples of mistake-proofing solutions in assembly operations. Mistake-proofing in short-run job shops can make the difference between profitability and bankruptcy. 8 real-life examples of mistake-proofing solutions in a job shop environment. Mistake-proofing is at the core of complex chemical operations. 8 real-life examples of common sense mistake-proofing solutions from the process industry that can trigger ideas to simplify your operation. Mistake-proofing is an important element of set-up reduction. 8 real-life examples of mistake-proofing solutions to aid equipment set-up and speed product change-overs. Mistake-proofing is not just for plant operations. 8 real-life examples of mistake-proofing solutions in the office. Understand the goal of mistake-proofing. Know the language of mistake-proofing. Be able to rank the relative power of the different forms of mistake-proofing effects. Have an understanding of some of the types of sensors available to achieve a shutdown effect. Have an understanding of some of the types of devices available to create a mistake-proofing solution using a warning effect. Know how to apply sensory alert effects to mistake-proofing. Learn to apply mistake-proofing solutions after the root cause has been found. Be able to evaluate whether the mistake-proofing solution is practical, feasible, and cost-effective. Learn how to build-in ways to assure your solution does not get overridden. Evaluate the robustness level of your solution. Become familiar with 10 improvement tools that complement the mistake-proofing process. The primary objective of this Unit is to expose you to a variety of mistake-proofing solutions to help you develop your own mistake-proofing solutions. The secondary objective is to help you think through the solution presented and then identify what type of solution has been used.